The Office of the Deputy Chief Justice is established under Art. 161(2)(b) of the Constitution of Kenya 2010. The Deputy Chief Justice deputises the Chief Justice and is the Vice-President of the Supreme Court. The Chief Justice assigns duties to the Deputy Chief Justice. The Deputy Chief Justice is responsible to the Chief Justice in the exercise of the functions and duties of the office. 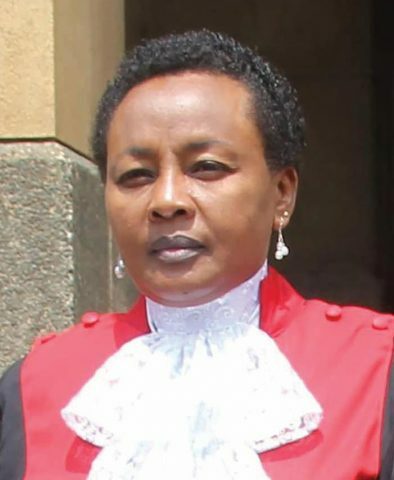 Lady Justice Philomena Mbete Mwilu is an advocate of the High Court of Kenya with over 33 years experience in the legal profession and holds a Bachelor of Laws (LLB) degree and a Masters of Law degree from the University of Nairobi. She was admitted as an advocate of the High Court of Kenya in 1984. She was in private legal practice in various law firms in Nairobi for the first seven years following her admission to the Bar. Thereafter she ventured into the corporate world working as a Senior Legal Officer in insurance; Board Secretary in charge of the day-to-day running of a State Corporation in regulation; the Deputy Chairperson of the Energy Tribunal; and later as Director on the Board of the Nairobi Water and Sewerage Company before being appointed a Puisne Judge in 2007. Lady Justice Mwilu first served in the Commercial Division of the High Court in Nairobi and later the High Court in Eldoret. She was later transferred to Nairobi where she served at the Criminal Division and subsequently headed the Environment and Land Division of the High Court. In November 2012, following a competitive selection process, Lady Justice Mwilu was elevated to the Court of Appeal where she served as a Judge of Appeal until her appointment as the Deputy Chief Justice, taking the Oath of Office on 28th October 2016. On 3rd May 2017 she was elected by her colleague judges of the Supreme Court to represent them as a Commissioner at the Judicial Service Commission. Upon appointment by the Honourable the Chief Justice, Deputy Chief Justice Mwilu also serves as the Judiciary Ombudsman and the Chair of the Implementation Monitoring Committee of the Sustaining Judiciary Transformation (SJT): A Service Delivery Agenda 2017 – 2021, the Honourable the Chief Justice’s five year strategic blueprint for the institution. In the discharge of her social responsibility, Lady Justice Mwilu has passionately role-modeled for the girl child and has actively mentored many girls and boys in secondary schools across the Republic of Kenya by visiting their schools and giving much needed guidance. She has actively participated in church events, including assisting in the construction of churches, as well as in charity events. For her service to society, the Deputy Chief Justice was decorated on 11th April 2017 by the Head of State, H. E. Uhuru Kenyatta with the award of Moran of the Golden Heart. On the family angle, Lady Justice Mwilu is a mother.